I was a non-believer in Western free markets. After reading Kishore Mahbubani’s interview, I realized, I was reading too much propaganda about how Indian mangoes could not be exported to USA for the last 18 years – because of pesticide residues. However, Indian farmers (with some devious trickery) ensured that pesticide residues vanished. A believer in free trade, USA allowed imports of mangoes into USA. USA, in turn taught India a thing or two about free trade. An enlightened India agreed to allow imports of Harley Davidson motorcycles. 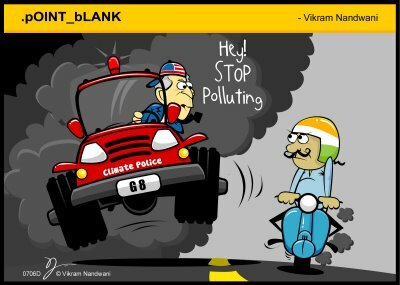 Of course, India was wrong in disallowing allegedly, ‘over priced, gas guzzling, polluting’ Harleys. For the last 300 years, the West did not allow imports of fabrics and garments. Dhaka’s de-urbanization due to this in the 1800-1900 is written into history – wrongly. The last law was the MFA agreement which created a quota based regime for textiles in the West. Agricultural subsidies of nearly 20 billion dollars by USA and EU each, to their farmers is also in the spirit of free trade. For the benefit of the starving Rest, the West is giving these subsidies to Western farmers to lower food prices. How does it mater that the agricultural economy of the the receipient nations gets destroyed. Things like non-tariff barriers are hookum and over-worked Eastern imagination.The story of repeated and frequent rejection of mushroom exports from India is also in the spirit of free trade. Indian applications for ‘equivalence’ certificates have been pending with EU for the last 7-8 years – and not processed for the last 7-8 years due to lack of manpower. Interim annuals approvals are given instead – in the spirit of free trade, after some ‘concessions’. Of course, the Western zeal for free trade extends to enforcing opium trade (just ask the Chinese). Kishorebhai, I only wish, as an ignorant Easterner that we in India can enforce ‘free trade’ in opium today in USA and the Europe. When the ignorant East, did not see the benefits of Western invention of free trade, the West was compelled to use use force (remember Commodore Perry? For more details, ask the Japanese). Mahbubani’s assertions are right. These ‘facts’ above are like a bikini. What they reveal is indicative. What they conceal is vital – in this case the Western spirit of free trade. How can Western wisdom (or ethics, integrity, motives) be questioned by the ignorant East. Of course, all these cases and incidents are a conspiracy to defame the West. Zilch. Zero. Sifr. Shunya. That is all. This claim about India inventing the zero and infinity is probably right. Because they had infinite knowledge about Zero – and nothing else. All their books about geometry (Aryabhatta, Bhaskara) are just figments of Eastern imagination. Eastern knowledge about eclipse prediction has now been proved wrong by Kishore Mahbubani’s expose. Indian shipbuilders and steel technology was just puffery – as demonstarted by Kishore Mahbubani. Of course as Hegel said, there is no African history. I realize after reading Kishore Mahbubani’s interview that there is only Western Science and Technology. It must been some Westerners behind the ‘achievements’ of China, Africa and India. PT Barnum adds – Are you not forgetting the option of crediting aliens. They were always mislead by their leaders. The only place in the world that they could find equity was in the West. If the West had not ‘bought’ these poor Blacks and allegedly ‘enslaved’ them, they would have still have been in Africa – and lost the benefits of the Western meritocracy. Some Black leaders are today claiming that they have even contributed to Western technology. Similarly, if the Gypsies had not left India, (supposedly) a thousand years ago, they would have lost all the benefits of Western civilization. Early Punjabi settlers in USA did not properly understand their position in Western society. They were basically inferior people who demanded equality to their White masters. This misperception of course created misdirected protests. These ignorant immigrants from the East did not properly understand Western meritocracy. The Red Indians were wiped out – nearly the entire race! Today they are a relic – a tourist attraction! Like rare animals in a zoo! Aborigines in Australia have similarly been annihilated. Two world wars in a space of 40 years. The entire Jewish population of the world has been reduced to 10 million – by the West. These wars were forced upon the West – and were fought to bring peace on Earth. Now since there are no Red Indians and Aborigines, how can there be a war with the Red Indians and Aborigines. Similarly, if there are no Jews, there cannot be a war with the Jews. The West is also trying to cleanse the Earth of all Muslims. Then there cannot be a war with Muslims also. St.Barnum pays tribute to Kishore Mahbubani – Kishorebhai, you concept of culture of peace is stunning to say the least. Hats Off. Consider the Western laws on slavery! And those related to minorities! The disenfranchisement laws came into effect by the 1890’s – that continue till today. This ensured that the disproportionate numbers of Blacks could not vote – and George Bush became the President of the USA for the 2nd time. After some 60,000 Black Voters were disenfranchised, George Bush technically, won by less than 1000 votes (most of the disenfranchised voters were expected to vote against George Bush). Petty crime (where poor) Blacks were convicted in higher ratios were grounds for disenfranchisement. These laws ensured that 10 times higher number of Blacks were disqualified compared to Whites. If that is not bad enough, it continues till now. Such tactics continue to be used to limit Black participation in democracy. Tomas Estrada Palma, ‘puppet’ Cuban President, signed the Platt Amendment of 1904 which allowed the USA to intervene at will – and finally modified only in 1934. The many laws which made Gypsy hunting legal – like laws which made hunting animals legal. The latest news in that Italians are going to crack down on Gypsies – as per a EU law. West does produce leaders, generation after generation, who relentlessly execute the same agenda. The annihilation, the massacre, the pogroms – against natives in America and Australia, monorties like Gypsies, Jews and various Christian sects. The kidnapping of Aboriginee and Gypsy children. The massacres in Africa – from Roman times to 20th century. And now the spectre of Islamic Demonization. Nothing more and nothing less. And their strategy to ‘white wash’ this – propaganda. With Kishorebhai’s plausible sincerety, I am not quite able to decide if Kishorebhai is an innocent and ignorant victim of Western propaganda or a part of the propaganda. This entry was posted in Uncategorized and tagged aborigines in Australia, Africa, African history, agricultural economy, Agricultural subsidies, Aliens Built The Pyramids, American, annihilating the Australian Aborigines, Annihilation, anti-Western polemic, Aryabhatta, Asia, Asian Toynbee, Australia, Australian Government, Bhaskara, Black contributed to Western technology, Black Voters disenfranchised, Blacks, bring peace on Earth, cats going on a pilgrimage after killing a hundred rat, China, cleanse the Earth of all Muslims, cloyingly subservient, Commodore Perry, conspiracy to defame the West, Country Model Of The West, culture of peace, de-urbanization, Deccan Herald, Dhaka, disenfranchisement laws, Dr.RA Mashelkar, Easter Island Statues, Eastern imagination, eclipse prediction, education, enforce 'free trade', equality to their White masters, equity, equivalence certificates, ethics, EU, EU law, Europe, European, figments of Eastern imagination, free market, garments, gas guzzling, geometry, George Bush, Gypsies, Gypsy hunting legal, Harley Davidson motorcycles, Hegel, History, ignorant East, ignorant Easterner, ignorant immigrants, ignorant view of the modern history, immigrants faced discrimination, India, Indian farmers, Indian mangoes, Indian shipbuilders and steel technology, inferior people, integrity, Italians crack down on Gypsies, Japan, Japanese, Jewish population of the world, Jews and various Christian sects, kidnapping of Aboriginee and Gypsy children, Kishore Mahbubani, Lee Kuan Yew School of Public Policy, Loot of gold resources ideas slavery, massacre, massacres in Africa, medicinal plants, meritocracy, MFA agreement, Mint 0a HT-WSJ publication, monorties like Gypsies, motives, National University of Singapore, natives in America, Niranjan Rajadhyaksa, non-believer, non-tariff barriers, Opium Trade, over priced, overwhelming evidence, pesticide residues, Petty crime, Platt Amendment of 1904, pogroms, pollutingfabrics, pragmatism, Propaganda, PT Barnum, Punjabi settlers in USA, quota based regime, rare animals in a zoo, Red Indians were wiped out, rejection of mushroom exports, rise and fall of civilisations, Roman times, rule of law, Science & Technology, science and technology, seven pillars of western wisdom, Shunya, Sifr, Singapore, spectre of Islamic Demonization, spirit of free trade, St.Barnum, subsidies to Western farmers, textiles, The Economist, The Hulk, The Shanghai Daily, the starving Rest, Times Of India, Tomas Estrada Palma, traditional knowledge, Two world wars, Ulta Chor Kotwal Ko Datein, ultimate foreign policy guru, US patents, USA, war with Muslims, West Is Best, western, Western civilization, Western education, Western free markets, Western invention of free trade, Western invention of Science and Technology, Western meritocracy, Western wisdom, Wisdom Of St.Barnum, Zero, zero and infinity, Zilch. Bookmark the permalink.